One of the ambitions of MiFID II is to promote price transparency in the financial markets – not only beneficial for law enforcement and regulators. Financial institutions are able to give better and more competitive prices benefitting the customers. The requirements on post-trade transparency data disclosure is an initiative that paves the way. However, since MiFID II entered into force in January 2018, the transparency regime still does not quite fulfill the intended potential. CMP has made an analysis of the data availability at European APAs. The transparency regime is one of the initiatives made by regulators to ensure a fair, competitive and transparent functioning financial market. Financial institutions are obliged to report post-trade transparency information to an Approved Publication Arrangement (APA), and the APA is subject to requirements as to how this information should be made available to the public. In short, the requirements demand publishing post-trade transparency data in a machine-readable format, that easily can be read, used and copied, and understood by an average reader. The information should be free of charge to the public, available for at least 24 hours, and not discriminate against who can access it. Furthermore, the APAs should disclose how to access their data. Implementation of MiFID II has been time consuming and costly for all financial firms, putting many resources into creating post-trade transparency data to report to the APAs. The benefits from this exercise is welcomed by financial institutions. The general need for regulatory reporting in the industry keeps increasing, and post-trade transparency data offers useful information in this regard. On November 14th, 2018 ESMA updated its Q&A on MiFID II and MiFIR transparency topics, by further elaborating on the above requirements. In May 2018 Risk.net concluded that four out of the nine APAs they considered, did not publish the data for free. Some APAs published data that could not be extracted or copied from their website, and some APAs only showed data by searching for a specific ISIN code at a time. An analysis made by CMP of the 16 APAs on ESMA’s Registers shows improvements in the availability of transparency data and compliance with the requirements. Note that our analysis only covers APAs and not trading venues, including trading on the Bloomberg & Thomson Reuters terminals, which are all covered by the Risk.net article from May 2018. CMP’s analysis investigates the following parameters; whether post-trade data is available for free to the public, how the data is presented, if it is exportable and for how long the data is available. The table at the end shows the findings of the analysis on these parameters. Most APAs publish data for free on their website, which is an improvement from May 2018. Only three publish exclusively through vendors like Bloomberg and Thomson Reuters, where data is free, if you already have a subscription. Some APAs publish both on their website and through vendors. 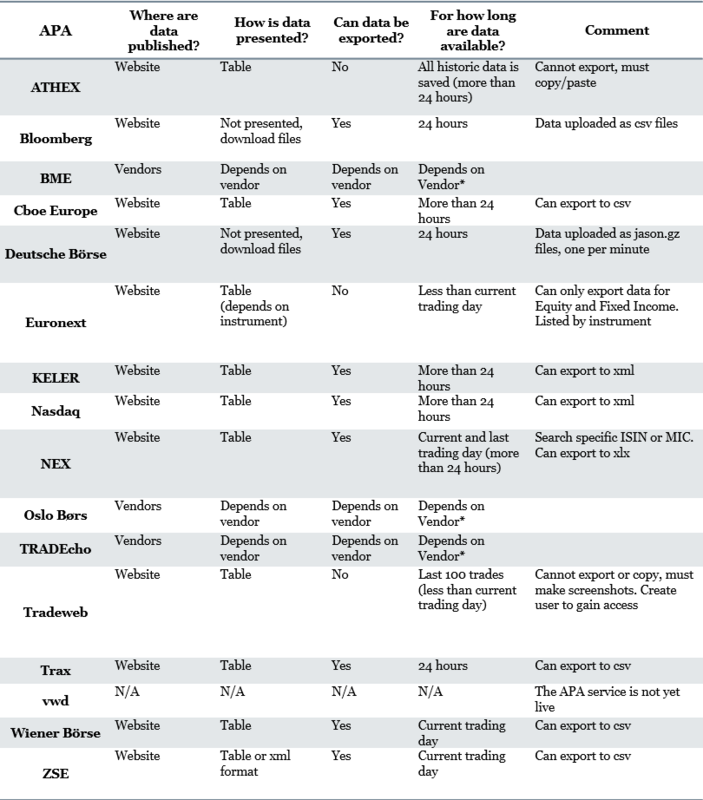 The data is either presented in tables or as files ready for download. Accessing the available data can be difficult; at some APAs a specific search by ISIN code or MIC is necessary. The data is however not always usable. Some APAs only present data as days high/low/average or by some other aggregation, making it difficult to identify the transparency concept. Most APAs present data for at least 24 hours/current trading day. Only at nine of the APAs is it possible to easily export the data into readable files. The rest will make you copy/paste the visible tables or have you taking screenshots. Comparing to the findings by Risk.net in May 2018, we mainly arrive at the same overall picture, however with some improvements a year after implementation deadline. This is also noted by a follow-up article from February 2019 by Risk.net themselves. With varying quality and duration of available data, there is still room for improvements. Using the data available now, does not paint a correct picture of the financial markets, making benefiting from the transparency regime premature. 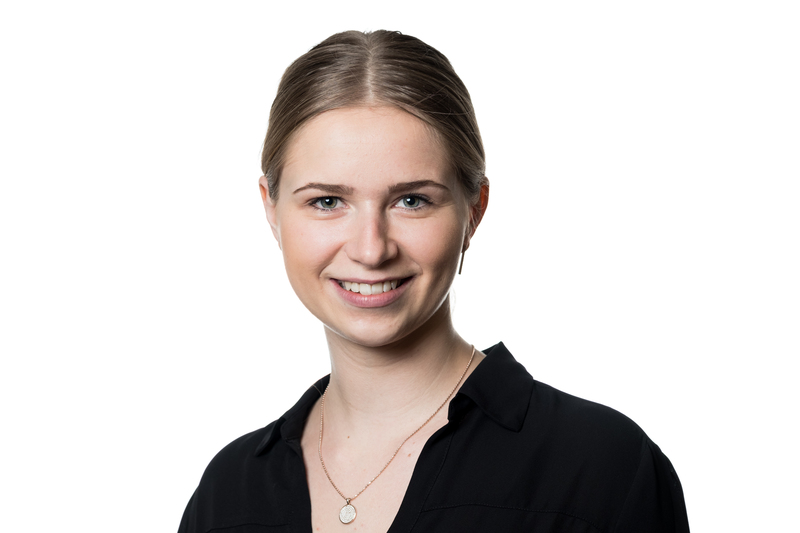 Christina Wibe Petersen is Junior Consultant and works closely with CMP’s experienced consultants when solving assignments. 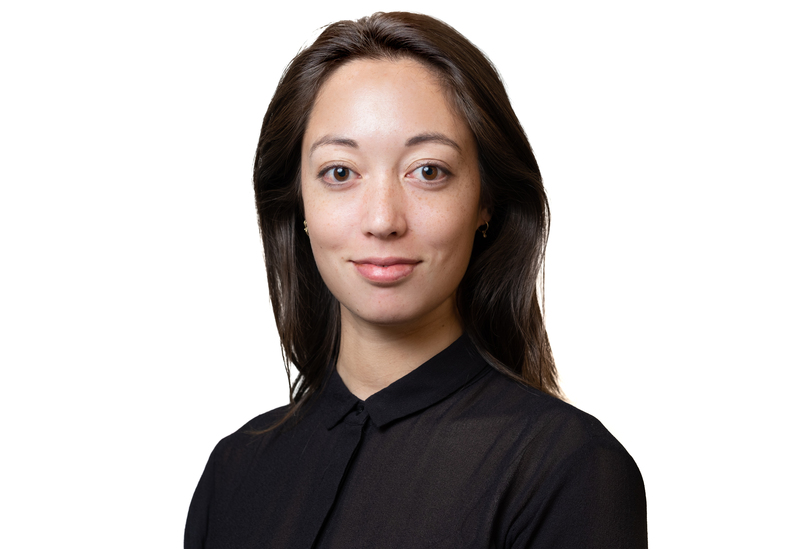 As part of the Investment Management team, Christina’s responsibility is to assist the consultants and clients in the team’s area of expertise, as well as accounting and modelling tasks. *At least one of the vendors used display their data for more than 24 hours.